Caerphilly County Borough Council who commissioned New York artist Brian Tolle to produce a piece of public artwork that projected a strong iconic landmark for Caerphilly on the A465. The sculpture was carved in polystyrene and then coated in 6mm of Armour-Lyte for its durability and its strength. 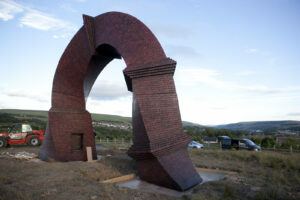 The outcome of the collaboration is Brian Tolle’s Simnai Dirdro (Twisted Chimney), a permanent art installation just off the “Heads of the Valley’s road” at Rhymney South Wales. Steel Monkey Engineering Limited who are a specialist manufacturer of staging and scenery for the film, television and exhibition industries in addition to producing bespoke artworks.